An electrically heated storage tank system is usually relatively cheap to buy and install, but is usually the most expensive to run, especially if it’s on the continuous (full day) tariff. Systems that run on off-peak electricity are much cheaper to run, but need a larger tank as the water heated overnight has to last you all day, and off-peak electricity isn’t available to all homes. These systems can be installed indoors or outdoors. A storage tank should hold a one day’s supply of hot water, the electric storage tanks come in 25, 50, 80, 125, 160, 250, 315 and 400 litres. For help with selection please contact our free call number 1800 689 919 or you can simple fill in the quick quote form and we will be in touch within 1-2 hours (within business trading hours). Dux electric tanks are available in 25, 50, 80, 125, 160, 250, 315 and 400 litre storage tanks. The 315 and 400 litre tanks are available in both single element or twin element. 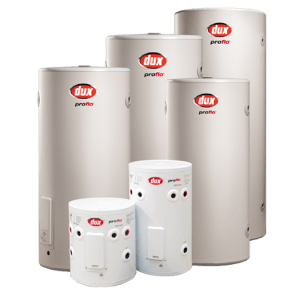 Dux offer up to 10 years warranty on their Electric storage tanks. 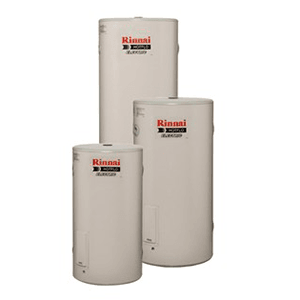 Rinnai electric storage tanks are available in 25, 50, 80, 125, 160, 250, 315 and 400 litre storage tanks. The 250, 315 and 400 litre are available in both single element or twin ele-ment. Rinnai offer up to 10 years warranty on their Electric storage tanks.